I absolutely love rustic snowmen. I fell in love with both of these pieces as I added the hat and scarf and final touches. These were difficult for me to post because, well...I wanted them for our home. The snowman with the burgundy scarf and green hat sold, however, the other one hasn't yet. I'll probably post it one more time. If it doesn't sell, there's a good possibility this piece will be added to our kitchen table decor. Right now, the only Christmas piece we put on the table is the small antique ceramic Christmas tree that our Great Aunt Ida made. I'm thinking that a rustic snowman would be the perfect addition. Are ya with me on this? 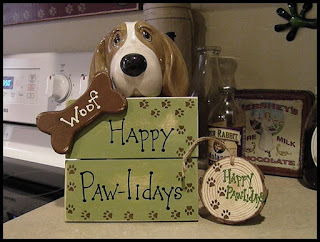 Today, I posted a doggy-themed item. Lisa made another slat style sign and cut out a wooden dog bone. I worked my magic in the workshop. In addition to the sign, we included a matching 'Happy Paw-lidays' ornament. We've got lots more items that I'll be posting in the days ahead until the Bodacious 12 Days of Christmas ends. Most of the pieces are done. I'm still working on a few.